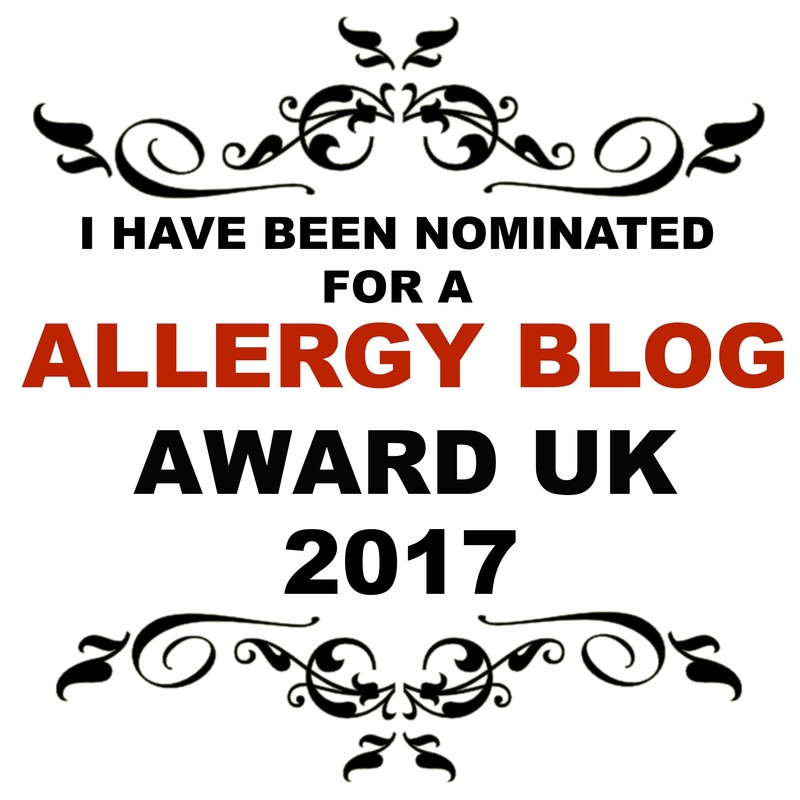 As most of you are aware the supermarkets have totally upped their allergy friendly game recently. 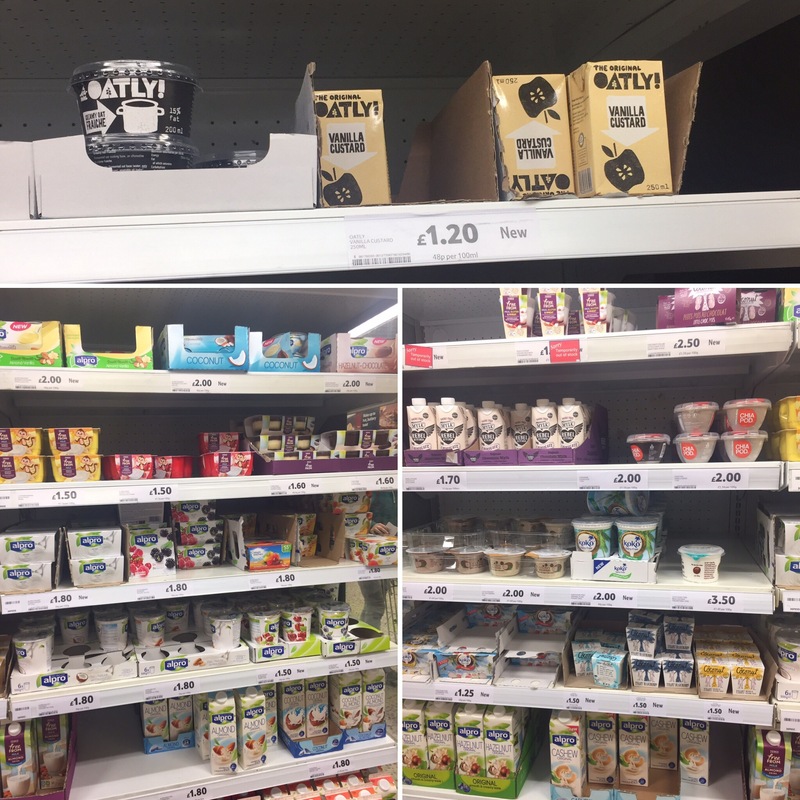 With multiple allergies it can be very tricky to find foods which fit the bill and are suitable, so you can imagine how pleased I was when I saw Tesco’s recent transformation of their chilled dairy section. Being nut and soya free can make choosing suitable dairy free yoghurts tricky. Fortunately for us we can tolerate coconut which really opens up the choice! 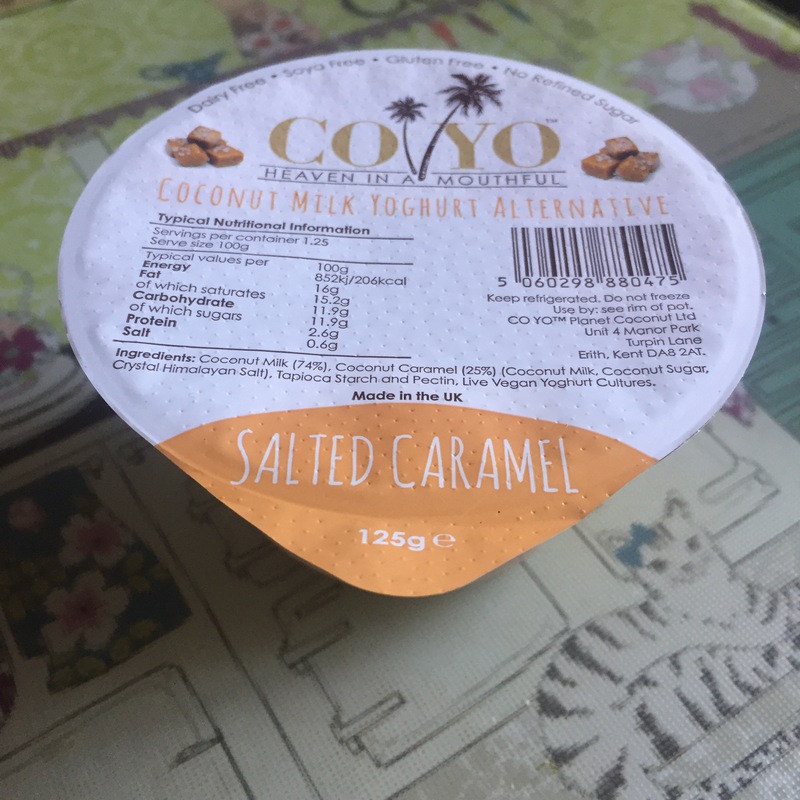 Coyo has always been our pick, especially the raw chocolate flavour, however Koko and the Coconut Collaborative are now also available to buy. We tried the Blueberry and Natural flavours. Both pots are fairly pricey at £1.50 for 120g which is one serving. However they are tasty and little one enjoyed them so for a pudding once a week it’s not too bad. I ended up serving them in a NomNom pouch as little one was unsure of the blueberry compote at the bottom. There are also Chocolate Pot desserts available however they contain soya so it’s no good for us. 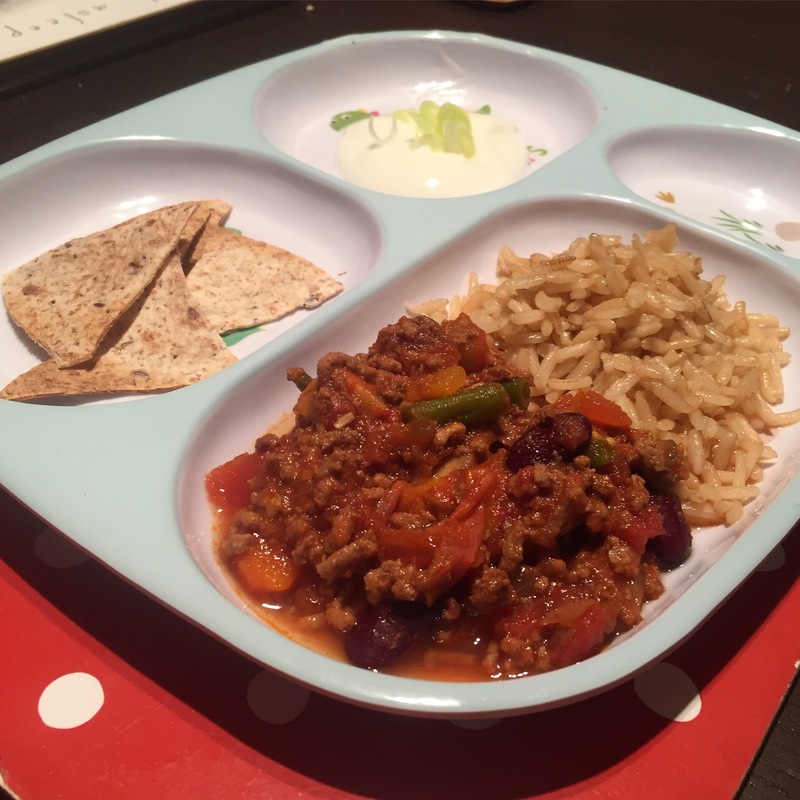 Koko’s Original Plain flavour makes a great accompaniment to a chilli con carne which we tried out earlier this week. At £2.00 for 500g I think it is well priced and in line with it’s dairy friends. With its neutral taste it is perfect for breakfast with berries or used in baking. I have a cupcake recipe coming up soon which uses it! 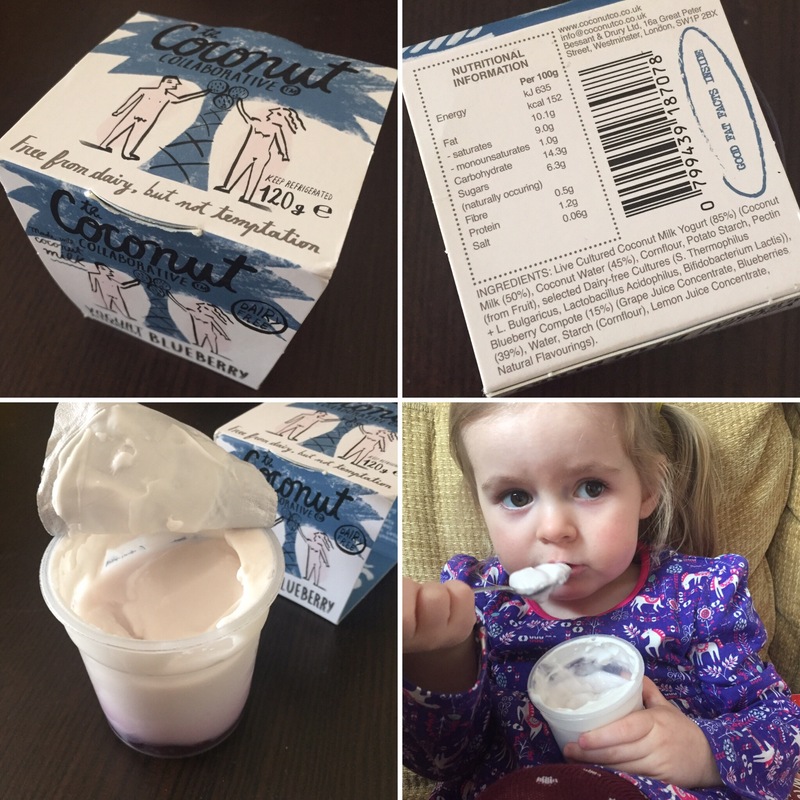 Coyo has always been our favourite dairy free yoghurt. Little one loves the raw chocolate flavour and can quite happily make one pot last a few days. This is handy as at £2.00 for 125g it’s not the cheapest. We bought the salted caramel flavour as well as I’m a sucker for anything salted caramel flavoured. Little one was unsure of it, but I loved it. This is probably for the best as I don’t like giving little one too much food with added salt. 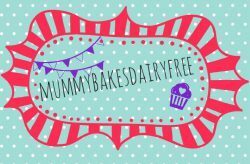 It would be a perfect treat for dairy free breastfeeding mummies. It didn’t taste too salty and was lovely, thick and creamy. We’ll probably stick to the raw chocolate flavour in future as it’s a guaranteed winner with little one. 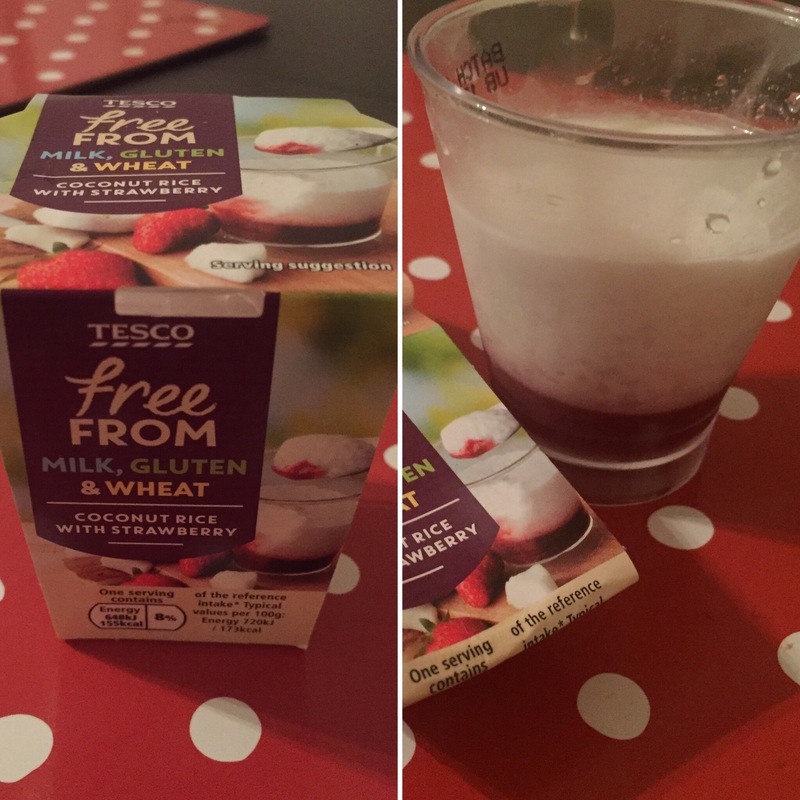 Tesco have also increased their own Free From chilled range. They have chocolate mousses which contain egg, so we thought we’d try the coconut rice pudding with strawberry. Unfortunately little one wasn’t too keen on the texture of this one so didn’t want to try much. I thought it was pretty yummy and would make a nice dessert. It wasn’t overly sweet but the texture was quite dense which I thought was a shame. They also do a mango flavour which I’d like to try next. Previously only found in the long life milk section, there are three new Oatly products in the chilled section and also refrigerated Blue Oatly. 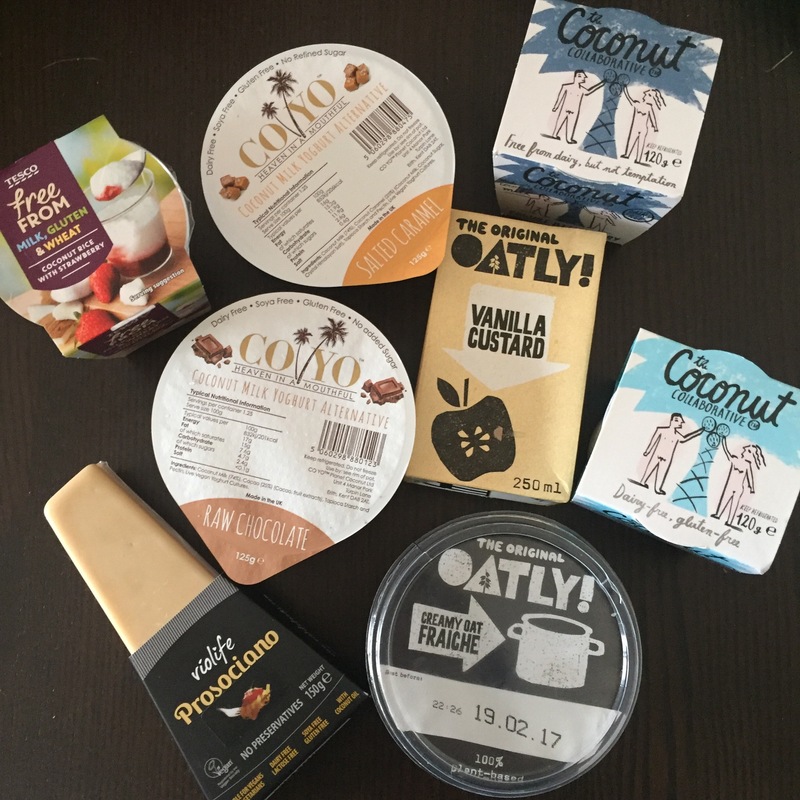 I was really excited to try the Oatly Vanilla Custard and the Oatly Creamy Oat Fraiche. The custard didn’t disappoint. I bought a couple of 250ml cartons for £1.20 each as I thought it wouldn’t stretch very far! However it is the perfect amount to accompany pudding for a family. It stretches even further if you whip it up using an electric whisk for a few minutes making it light, fluffy and extra delicious!! I haven’t heated it up myself but I have heard from others that it turns a little watery, so it may be worth investigating. Little one loves it for pudding with berries and a drizzle of Sweet Freedom Choc Shot. I’ve also used it in my Banoffee Tarts and it worked a treat. To be honest I’d happily eat it from the carton!! I also bought a couple of tubs of the Creamy Oat Fraiche. I was planning to use it as part of a white sauce in a chicken lasagne. However I wasn’t overly keen on the taste. It had the tang of dairy creme fraiche but I didn’t really like the after taste. Oh well, you can’t like everything I suppose. I know lots of other people who do like it. We’ve tried most of the Violife products on the market but don’t really use them very often. This is mainly due to the fact that little one has never really experienced cheese so finding an alternative hasn’t really been necessary. However Violife is great for us as it is soya free as well as being dairy free, so I was pretty excited to see Tesco stocking the Prosociano Parmesan flavour. At £3.50 for 150g it’s more reasonably priced than other shops. It also lasts for 15 days once opened which gives you plenty of opportunity to get through it. I’ve finely grated it for a couple of recipes and it worked well. It melted nicely on top of a pasta bake however it worked best stirred through mashed potato to make cheesy mash. Unfortunately little one didn’t want to try the mash as she really dislikes the texture but everyone else liked it. It’s great to know that there are some new foods which we can get each week especially as the usual soya or nut alternatives are no nos for us. The prices aren’t cheap however they do compare with the ‘Finest’ or more high end desserts and yoghurts available. 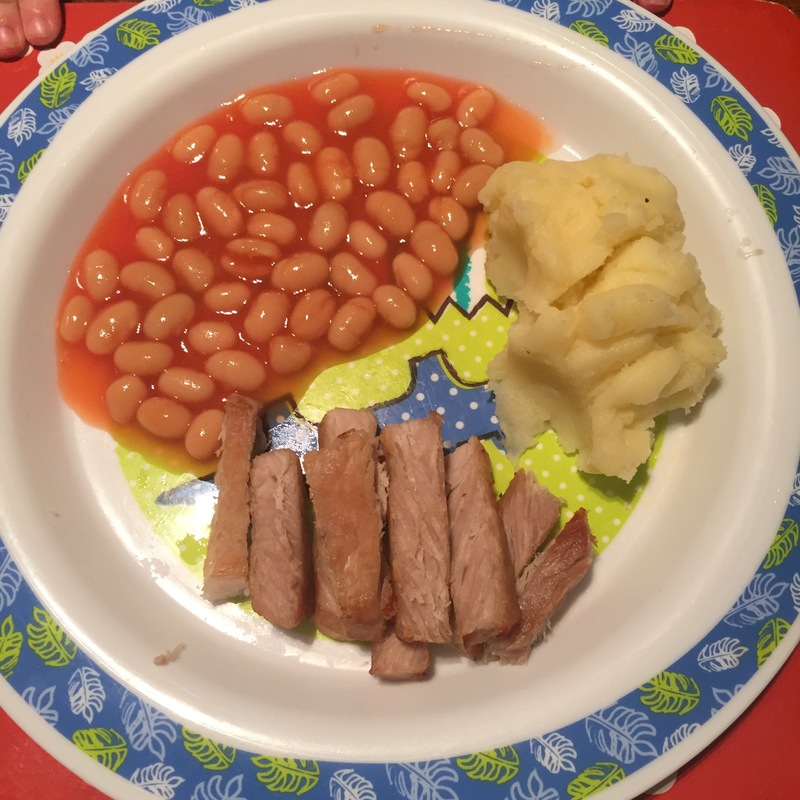 I would like to see some more products packaged and portioned appropriately for children which aren’t soya based, but at least the supermarkets are moving in the right direction. I’d love to hear what you think of the new lines, so please do get in touch!